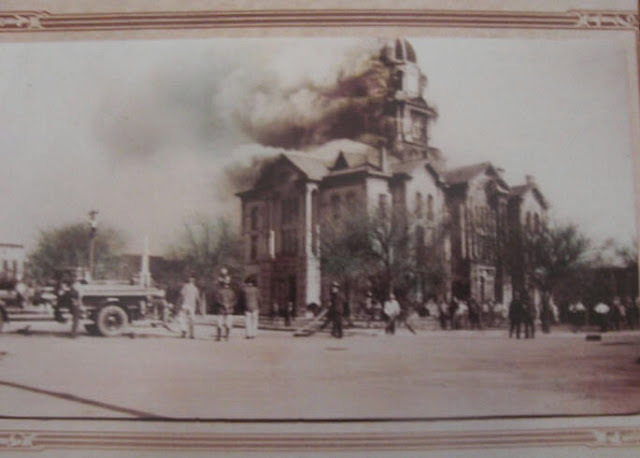 Genealogists' nightmares include the images of courthouses burning. The image of the burning courthouse is almost always accompanied by the fear of catastrophic loss of valuable genealogical records. This primal fear comes from ignorance. Often, the loss of the courthouse is equated with a complete inability to obtain records concerning family members, i.e. ancestors in the county where the fire occurred. This is more of an excuse for poor research practices than a real inability to find the records. The fire depicted in the photo above is of the Fannin County Courthouse in Texas. It burned on New Years Eve 1929. There is an account of the fire on the Fannin County TXGenWeb, Fannin County Courthouse page. There is also a prominent statement in red that says, "Few records were lost." Oh, but you say, that was not the case in my county. All the records in courthouse were a complete loss." Yes, that does happen. I wrote about this a couple of years ago in a post entitled, "Lost books, Lost Records, Burned Counties." My suggestion at that time, in 2013, was to consult the FamilySearch.org Research Wiki page on burned county research. That is still my suggestion, but there is a far more important issue here. Books in general. Not all the books in the county would be stored in the courthouse. So biographies probably escaped. Cemetery records. The headstones in the cemetery and their accompanying records were unlikely kept in the courthouse. Census Records. The county may have done a census, but the U.S. Census records for the county were probably not lost. The U.S. Census has its own issues with fire loss. Church histories. Come on now, do you seriously believe that the local church records were kept in the courthouse. Genealogy. Interestingly, I can't recall having the idea of genealogical records being raised in conjunction with a courthouse fire at all. This would include, of course, the local citizens' Bible records. History. We are back to books. There may have been some books in the county courthouse, but what about the rest. I am going to take a break from the list for a second and give you a list of the histories of Fannin County, Texas in the WorldCat.org catalog. Bonham Public Library. Fannin County Folks and Facts: Fannin County, Texas : A Collection of Historical Sketches and Family Histories. Bonham, Tex. : Bonham Public Library, 1977. Burleson, Muriel Champion. A History of Ladonia, Texas, 1836-1997. Ladonia, Tex. : Ladonia Historical Preservation Society, , 1997. Buss, Karen, and California) Southern California Genealogical Society (Burbank. An Every-Name Index to “Fannin County Folks and Facts.” Burbank, California: Southern California Genealogical Society, 1990. Carter, W. A. History of Fannin County, Texas. History, Statistics and Biographies, Business Cards, Etc. Bonham, Tex., 1885. Davis, Kathryn Hooper, and Joe E Ericson. East Texas Militiamen, 1838-1839. Fannin County, Houston County, Nacogdoches County, Red River County, San Augustine County, Shelby County Volume 2 Volume 2. Nacogdoches [Tex. ]: Ericson Books, 1992. Davis, Wallace. Index, A History of Fannin County by Floy Crandall Hodge. Conroe, Texas: Montgomery County Genealogical & Historical Society (Texas). Ericson, Carolyn Reeves. Fannin County, Texas in the Civil War, 2010. Fannin County Genealogical Society (Fannin County, Tex. ), Church of Jesus Christ of Latter-day Saints, and Bonham Ward. The History of Fannin County, Texas, Churches. [Bonham, Tex.? ]: Church of Jesus Christ of Latter-day Saints, Bonham Texas Branch, 2003. Fannin County Genealogical Society (Texas). The History of Fannin County, Texas, Churches: Volume 1. Bonham, Texas: Church of Jesus Christ of Latter-day Saints. Bonham Texas Branch, 2003. Fannin County Historical Survey Committee. Historic Markers of Fannin County. [Bonham, Tex.? ]: The Committee, 1976. Fannin County Museum of History. Civil War Veterans. [Bonham, Tex.? ]: Fannin County Museum of History, 1992. Fannin County (Tex. ), Board of Land Commissioners, Gifford E White, Texas, and General Land Office. Minutes of the Board of Land Commissioners, Fannin County, Texas, 1838-1840. [Place of publication not identified]; St. Louis, Mo. ; [Nacogdoches, Tex. ]: G. White ; Distributed by F.T. Ingmire] ; [Distributed by C.R. Ericson], 1981. ———. The First Settlers of Fannin County, Texas: Minutes of the Board of Land Commissioners, Fannin County, Texas, 1838-1940. Nacogdoches, Tex. : Ericson Books, 1995. Frair, John. A Pictorial History of Fannin County. Bonahm, Tex. : Pub. Plus, 1990. Gorom, LaNier Carter, Martha Freeman, Bernice Hill Beaty, and Texas) Daughters of the American Revolution. George Blakey Chapter (Bonham. George Blakey Chapter, 6-039 TX, National Society Daughters of the American Revolution, Bonham, Texas, Fannin County. Bonham, Texas: Daughters of the American Revolution. George Blakey Chapter, 1988. Gribble, Bertha Jane. “Sidelights of the History of Fannin County,” 1939. Hodge, Floy Crandall. A History of Fannin County, Featuring Pioneer Families. Hereford. Tex. : Pioneer Publishers, 1966. Ingmire, Frances Terry. Bonham, Fannin County, Texas Log Book, 1885-1889: Maddrey & Hunter Livery Stable. St. Louis, Mo. : Ingmire, 1980. ———. Confederate Pension Applications of Fannin County, Texas. St. Louis, Mo. (10166 Clairmont Dr., St. Louis 63136): F.T. Ingmire, 1981. Jones, Keith. Fannin County. Charleston, SC: Arcadia Publishing, 2012. http://www.aspresolver.com/aspresolver.asp?LRHO;73859188. Lusk, R. M. A History of Constantine Lodge, No. 13, Ancient Free, and Accepted Masons, Bonham, Texas. Bonham, Tex: [Favorite Print. Co.], 1917. Morriss, Berniece Howell. “A Literary History of Fannin County,” 1952. Newhouse, Patricia Armstrong. Fannin County, Texas, Union Veterans, 1890: Also a Few Confederate Veterans Who Were Listed in Error (see Addendum). Honey Grove, Tex. : Newhouse Publications, 1984. Northeast Texas: Historical Articles about Its Beginnings. Paris, Tex. (PO Box 94, Paris, TX 75460): Wright Press, 1984. Scott, Tom. Fannin County, the Early Years: Land Grants, Bounty Warrants, Muster Rolls, and Tax Rolls, 1836-1840. Bonham, TX: Fannin County Genealogical Quarterly, 1982. Sister Grove Association. Minutes of the Ninth Annual Session of the Sister Grove Association, Held with the Sandy Creek Baptist Church, Fannin County, Texas, on Friday, the Thirteenth and Monday, the Sixteenth Day of September, A.D, 1861. Marshall, Tex. : Printed at the Republican Office, 1861. Smith, David Ryan. “Reconstruction and Republicanism in Grayson, Fannin, and Lamar Counties, Texas, 1865-1873,” 1979. Spencer, Juanita C. Bonham--Town of Bailey Inglish: Events of People in Bonham and Fannin County. Bonham, Tex. : Spencer, 1977. Strickland, Rex Wallace. “History of Fannin County 1836-1843.” Southern Methodist University, 1929. Tate, Ron, and Jodee Stallo. Yesterday Revisited: A Pictorial History of Fannin County, Texas. Marceline, Mo. : D-Books Pub., 2001. Teachers of Emergency Education (Fannin County, Tex.). History of Fannin County, 1836-1936. [Place of publication not identified]: [publisher not identified], 1936. University of Texas, Bureau of Business Research, and Texas & Pacific Railway. An Economic Survey of Fannin County. [Austin, Tex. ]: Bureau of Business Research, College of Business Administration, University of Texas at Austin, 1949. Wimberly, Vera, and Montgomery County Genealogical & Historical Society. Index, a History of Fannin County. Conroe, Tex. : Montgomery County Genealogical & Historical Society, 1980. Well, that is quite a list. Now I will go back to my list. Newspapers. You can't seriously believe that all the newspaper records in the county were kept in the courthouse. Maps. Again, you think all the maps were burned? Military Records. This one is obvious. Obituaries. Go along with newspapers. Societies. All the organizations in the county kept their records in the courthouse? That leaves us with these few, but very important records that may have been destroyed. Vital Records kept in the County. I have raised these issues before but my questions are still good ones. Did the county residents have to pay taxes to the county after the courthouse burned? Were the county residents able to buy and sell real property after the courthouse burned? Were the people still married when the courthouse burned. These are serious questions and the answers would seem to be obvious. So where did the records come from to allow the residents of the county to marry, buy and sell property, and pay taxes? Think about this for a while. The real effect of a burned courthouse is that many of the records had to be reconstructed. But the larger effect is that many valuable records were not burned or destroyed by Sherman's March to the Sea or whatever. They just aren't the types of records that most genealogists like to search for. Presently, I have 14,422 Record Matches provided to me by MyHeritage.com. I also have over 100,000 Smart Matches. How long would it have taken me to individually search for and find each of those potential sources? I also have 8,981 Record Hints waiting in Findmypast.com. 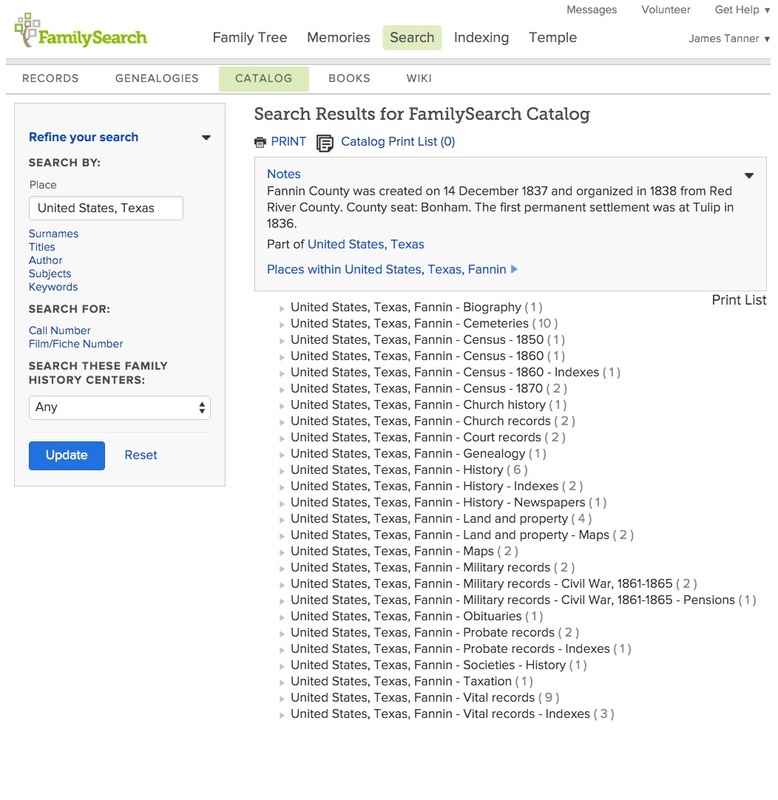 If you add in the number of Record Hints I have waiting for processing on the FamilySearch.org Family Tree and the 9,793 Record Hints I have waiting in Ancestry.com, you can begin to see what I have been talking about in this series. By the way, the total of number of record hints is actually much larger since when I confirm a record hint, the programs will automatically look for more based on my confirmation. If you do not understand what those numbers mean, then you are simply unaware of the reason for this series. What this means is that these four programs have extensive documentation for the names of the people in my family tree without any effort on my part other than entering the names the first time into the program. Here are some thoughts on how to handle all this information. Start small. Take your time entering names into these online family trees. DO NOT start by uploading a GEDCOM file of your existing database. Those of us that have thousands of names in a database, some without adequate documentation, cannot assume that our information is correct. Let the programs do their work. As you receive record hints, take the time to think and not just click. Record hints are just that: hints. You still have to think about what you are doing and figure out if the programs have found the right information for the right people. They are not 100% accurate. Start by adding in records for your own parents etc. one-by-one. It is a huge mistake to start a pedigree on any one of these programs that does not link back to yourself. The programs as based on a pattern of ancestry beginning with yourself. If you start trying to find someone back centuries, the programs will not be much help at all. You are also making an assumption that all of your previous research is accurate. This may not be the case. Designate a database program as your "master" file. It does not matter which program you choose. The program can be a standalone database on your computer or one of the online family tree programs, but you need to have a central place to gather the records from all these record hints and the other research you have already done. Don't make the mistake of assuming you don't need to add all these sources to your files. Some people think they already know everything about their ancestors and these "sources" are just a bother. This is a real serious mistake. Genealogists have already spent too much time repeating research that has already been done. Let the programs help you untangle the mess you may have inadvertently created by assuming your pedigree was already done. Focus on the individuals you are researching and ignore the rest for the time being. You don't have to do your own research according to the schedule of those who write computer programs. Choose the people you want to investigate and ignore hints for all those relatives you have not yet become acquainted with. Build a solid base of information about your ancestors and their descendants. Add sources to each individual in your family tree, family by family and individual by individual. Do not heed the siren call of the missing ancestor. Wait until you have adequately documented your entire connection to the remote ancestors before spending a great deal of time looking for them. Recognize the fact that each of these programs has a finite set of records. This means that they may not find any records for a specific individual. It may also mean that you have the wrong name, wrong places or wrong dates. Resist the temptation to add in people from your unsubstantiated pedigree, i.e. those lacking identifying source records. This is one of the major issues I find with those working on the their ancestry. They assume that Aunt Matilda or Grandmother Jones were perfect and everything they said about their ancestry is correct. This is a major trap for the unwary. Any ancestor with no source records is suspect. If you skip over an ancestor with no sources, you are simply copying and not doing research. Add in all the sources found, even those that duplicate sources you already know about. These programs need to be told that the searches they make are correct. You need to confirm a match even if the record is a duplicate of one you have already found. If that bothers you, then you don't understand the process or the programs. This list could go on and on. But it is time to summarize. You will find links to many other family tree programs in addition to the four I highlighted above. The answer to looking at a suggested relative from another family tree is to ask is there are any sources documenting the connection with your own family. Many people, like me, added people to my file without proper documentation. In my case, this was done years ago before I learned about the need for sources for each individual. Presently, I am in the process of documenting every individual in my ancestry. I am back to the sixth generation and moving down the list of ancestors. I will then move on to the seventh generation where many of the people listed are not substantiated at all and where I will likely run out of record hints entirely. Even if you decide to investigate a single ancestral line and ignore the others, you need to do this systematically and not base your research on the assumption that the pedigree you have recorded is correct. Remember, when I say I am working on the sixth generation, I have, at least, 32 sets of ancestors, unless there are more through multiple marriages. Overall, let the programs help you find the right people in your ancestral lines. Don't fight the technology and don't ignore it. Now, think about how this changes the way you might have approached genealogical research in the past. Don't worry, I am going to write about what happens when the record hints fail to provide any sources. Stay tuned. At this point in the series, I need to ask a pertinent question. Why don't I put all my academic letters after my name? Why aren't I addressed as Dr. Tanner? The answer is not simple and it has a lot to do with all of what I am addressing in this series.The simple answer to the question is so what and who cares? If I can't write and communicate then all the letters in world aren't going to convince anyone of anything. As I appeared in court over the years, no one really cared who I was or what my qualifications were. Other than the fact that I was a licensed attorney, the court could care less about my resume or qualifications. If I knew what I was doing or if I did not, then the opposing counsel and the judge would know about it pretty quickly. No letters behind my name would change that. The same goes here. If what I write is garbage, then no one will read it or care. Letters behind my name don't change that. I don't need to impress anyone and I certainly do not need to "make a living" from genealogy. I certainly enjoy writing, it keeps me busy in my old age, but I am still constantly surprised that anyone reads what I write. But here, online, I can keep writing away about topics I feel strongly about. It just so happens that I have spent half my long life doing family history. Genealogy matters to me. Not because I want to profit from it or make a name for myself, but because I see the need to share what I know and what I do not know. As I say at the top of my blog, some people eat, sleep and chew gum, I do genealogy and write and I might add, think. I see some very serious issues within the larger genealogical community. Genealogy is a highly technical and complex pursuit. It takes a relatively long time to learn some of the basic skills needed to do adequate genealogical research. As I have pointed out in previous posts, traditionally, those skills were possessed by a cadre of professionals who had collectively developed their skills with a tradition of hundreds of years of trial and error. Genealogy has an intimate relationship to the general topic of historical research but for very complex reasons, genealogists have been excluded from the venue of academic-based history. As an alternative to academic acceptance, genealogists have created their own hierarchal structure. Those caught up in the hierarchy are comfortable in their assumed superiority. But now, there is a serious and unanticipated threat to the genealogical homogeneity. That threat is the information revolution. Professionals become professionals either because they can do things most people do not know how to do or do not want to take the time to do. They codify their professional positions by exclusionary practices. For example, law was once something anyone could study and practice by merely "reading law" in a law office. Now, it is a highly regulated and structured profession requiring years of schooling and a major examination. There are those who would like genealogy to move in the same direction. This is where the new technology becomes a threat. If I can put my basic family information online and then have an automated searching program supply me with valid sources for extending my family lines, isn't this very similar to online will programs and do-it-yourself divorce documents in the law practice? The lawyers can defend their practice by keeping the rabble out of the court system. Genealogists do not have that advantage. There is no way any genealogical group or organization can keep me or anyone else from "practicing genealogy." In fact, if I so desired, I could join a "professional" genealogical organization by signing an agreement and paying my dues. So how do online automated record hints threaten the genealogical status quo? The answer is simple. By providing online research hints with a high degree of accuracy, the large genealogy companies are demonstrating that much of what genealogists do and what professionals charge money for can be automated. No, the professional genealogists are not going to go out of business any time soon simply because Ancestry.com and MyHeritage.com and others supply research hints, but the handwriting is on the wall. Genealogy will be dramatically changing over the next few years. We could also add DNA testing into the mix, but that is a different kind of issue. DNA is another complex shield where the professionals can exercise their "expertise." In my past posts, I mention the paucity of presentations at the upcoming RootsTech 2016 Conference on record hints and the new technology. There are only one or two classes that even mention the technology in passing out of 281 classes. There are 17 announced classes talking about DNA, most of which are planning on talking about the complex jargon filled details of the subject. Now where does this record hinting technology come in? Why is it so revolutionary? 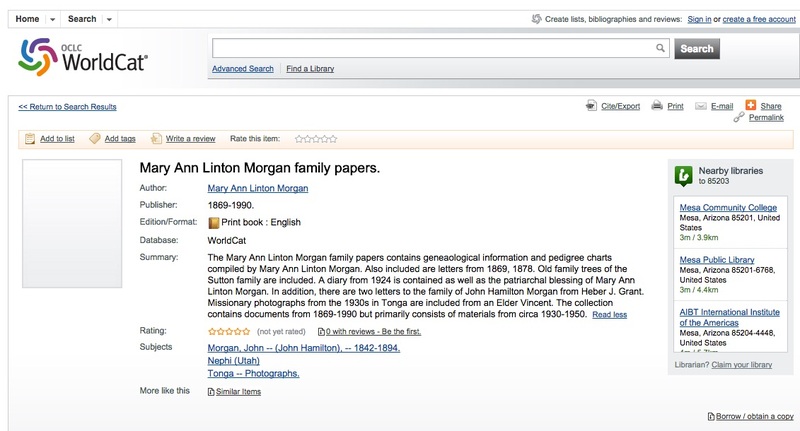 Essentially, I can enter a little bit information into these new online programs (MyHeritage.com, Ancestry.com, Findmypast.com and FamilySearch.org) and in many cases, probably most cases, the automated search capabilities of the programs will start suggesting documentation that has the potential of extending my pedigree. The user of the program is still required to exercise analytical skills and good judgment to build a valid pedigree, but much of the initial work of finding source documents is done automatically. This process becomes more accurate and successful in finding records as records are digitized and indexed and then added to the online databases. Because the programs either use a unified family tree program such as FamilySearch.org or rely on separate user trees as the other programs do, the programs can also directly indicate and identify other researchers working on the same family lines. All this occurs outside of the hermetically sealed and copyright protected enclave of the professional genealogist. I am certainly aware of the limitations of online family trees. My main criticism has always been their ad hoc nature due to a lack of documentation. But now, even the most inexperienced of those participating online can find basic source documentation for an extension of family lines. We could take a "business as usual" approach to the new developments and ignore the impact of having all this information readily available, but on the other hand, we could realize that the existence of all these online documents and the automated search features are changing the way genealogy will be done in the future and is being done right now. So what do we need to do to take advantage of the new, developing technology? So stay tuned. Here is a press release from RootsTech 2016 announcing this next year's Keynote Speakers. SALT LAKE CITY, October 27, 2015—RootsTech, the largest family history conference in the world, announced today the first three keynote speakers in its all-star lineup for RootsTech 2016. The first general session (Thursday, February 4, 2016) will feature three inspiring speakers, which include New York Times bestselling author Bruce Feiler, award-winning journalist Paula Williams Madison, and the president and CEO of FamilySearch International, Stephen Rockwood. Bruce Feiler is a bestselling author and columnist for The New York Times, where he writes the “This Life” column about today’s families. He is also the writer and presenter of the PBS Series Walking the Bible and Sacred Journeys with Bruce Feiler. His latest book, The Secrets of Happy Families, reviews best practices for modern-day parents from some of the country’s most creative minds, including top designers in Silicon Valley, elite peace negotiators, and the Green Berets. Paula Williams Madison is an award-winning journalist who is a former NBC executive. Currently, Madison serves as chairman and CEO of Madison Media Management LLC, a media consultancy company based in Los Angeles with global reach. She’s been named one of the “75 Most Powerful African Americans in Corporate America” by Black Enterprise Magazine and was recently honored by the East West Players and AARP with their Visionary Award. After a successful career in news journalism, Madison retired in 2011 and embarked on a search for her grandfather Samuel Lowe, who returned to his native China after living in Jamaica. Madison produced a documentary film on the topic, Finding Samuel Lowe: From Harlem to China. In April of this year, HarperCollins published a memoir of the journey Finding Samuel Lowe: China, Jamaica, Harlem. Stephen Rockwood is the new president and CEO of FamilySearch International and managing director for the Family History Department of The Church of Jesus Christ of Latter-day Saints. Prior to joining FamilySearch, Rockwood was a successful entrepreneur, creating unique service offerings for worldwide customers and building several businesses from the ground up. “We look forward to another great RootsTech conference as we invite attendees to discover their families in a world-class setting. We are thrilled to welcome Bruce Feiler and Paula Williams Madison,” Rockwood said. “Their personal experiences will be highly inspiring for many as we kick off this exciting conference. Visit RootsTech.org to reserve your seat now to hear Bruce Feiler, Paula Williams Madison, and Stephen Rockwood at the Thursday morning general session on February 4, 2016. Passes start at just $29. RootsTech 2016 will be held on February 3–6 in Salt Lake City, Utah. I recently attended a one-day conference. After listening to the presentations on a variety of genealogical subjects, I noted that none of the presenters even mentioned the fact that much of the "research" they were talking about was being done automatically by the large online genealogical database programs. None of the presenters even alluded to the fact that the average beginning genealogist around the world could also plug into a huge online community of potential relatives. From a traditional (outmoded) standpoint, their presentations were remarkable in their depth and detail. The main problem was that many of the techniques and methodology they covered were obsolete. Yes, I am saying that the Emperor has no clothes. I might also mention that during this whole presentation, in between classes and at lunch, I had a very interesting discussion with some very knowledgeable genealogists about some of more pertinent issues facing genealogists today. The lone mention of technology was one presentation on the use of DNA, hardly a new or very novel idea. Even the mention of DNA failed to further mention the advantages of using the online programs to find candidates for the DNA matches. It is like trains passing in the night. The "big names" in genealogy talk about everything except the revolutionary changes occurring almost daily. There are presently 281 classes scheduled for RootsTech 2016. There is one class on FamilySearch Hinting. There are two classes that talk about "going beyond hints." What is entirely missing is even one class on what is going on in the larger genealogical context with automatic record search technologies. It doesn't look like RootsTech 2016 will touch on the subject of the new paradigm, at least not in any classes I see scheduled so far. What exactly is going on? 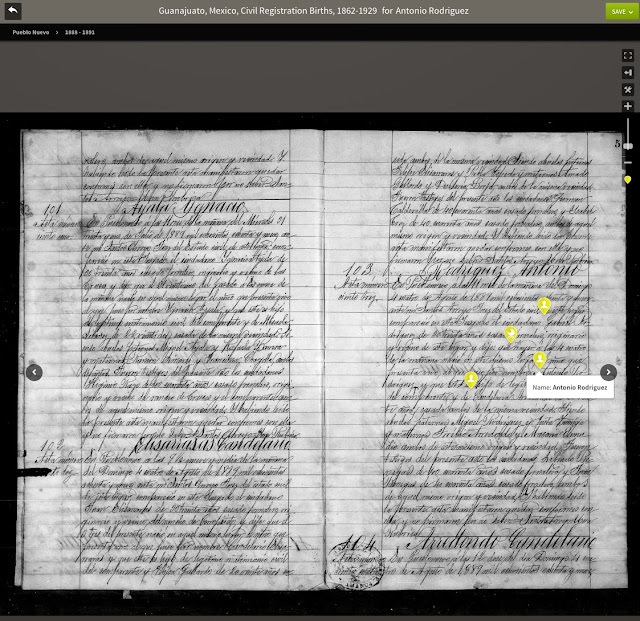 Today Ancestry.com announced the addition of over 220 million indexed, searchable Mexican historical records. It is very probable that those with Mexican ancestry who have a family tree on the Ancestry.com website will shortly start to receive "Green Leaf" record hints for these records. Of course if you are an experienced researcher in Mexican Civil Registration records and Catholic Church Parish Registers and Bishop's Transcripts, you have likely used similar records on FamilySearch.org, few of which are indexed. The important point is the issue of "record hints." Failure to obtain record hints does not mean that the records are missing, but receiving record hints is a big step forward if you have been working your way, name by name, through years of parish registers. As more records are added to the huge collections online and then indexed (or indexed and then added as is the case with Ancestry.com) then record hinting moves forward helping to find more individual ancestors and families. FamilySearch is calling this "Fueling the Find." Now don't get me wrong. I have recently been searching through microfilmed records that are still not digitized. But I also have tens of thousands of record hints waiting for me to process, primarily on MyHeritage.com but also on FamilySearch.org, Ancestry.com and Findmypast.com. In the past few months both my wife and I have been measurably assisting in resolving some 100 year old end-of-line situations with the assistance of record hints from all four of these websites. What we have here is the classic confrontation between a traditional methodology and new technology that radically changes that traditional methodology. Those genealogists with the most extensive training in the "traditional methodology" are the ones that most resist the changes. They do this by focusing on the details of the methodology, such as citation format and proof statements, and try to ignore the impact of the technological changes. Where genealogy was an arcane, marginal pursuit practiced by a few dedicated people, it is now becoming an open, rapidly developing, technologically driven, populous enterprise, and a big business to boot. Think about the effect of industrialization and technology on consumer products. If you go back just 100 years or so, most of the products used by people in the United States were produced locally and many were handmade. In 1915 the first automobile had yet to visit the town where my grandparents lived. They had never seen an airplane or if they had, it was a novelty. They were still outside of the rural electrification effort and most of them did not have indoor plumbing. When I was young I saw my neighbors across the street abandon their privy and install indoor plumbing for the first time. I also remember crank telephones and a central, very local, switchboard with a live operator who sat in an office on the main street. There are still a lot of locally made and handmade items, but we certainly do not live in the same world my grandparents grew up in. I just drove 750 miles to and from Mesa, Arizona in a day, while talking on the telephone in my car from various locations along the way. We are presently at one of those technological shifts, call it a revolution, in the world of information. I live on computers day and night. I am in almost constant contact with the entire world and carry on conversations around the globe. I just answered an email I got from Columbia in South America. Like it or not, genealogy is caught up in a paradigm shift. We have been using the same methods of research for hundreds of years. Suddenly this is all changing. We are moving from an individually oriented and solitary research mode into an open, online collaborative model. Instead of focusing on years of drudgery in researching the same records over and over again, we are being liberated from this redundancy. If someone, somewhere in the world discovers a document that answers one of my ancestral questions, there is now a possibility that I will benefit from his or her work. Likewise, if a wrong conclusion is reached by someone, I can correct it and show exactly where the answer can be found. What is preventing this new technology from advancing even faster? In one word: ownership - the idea that we own the information we find as researchers. The FamilySearch.org Family Tree and the other online family trees are the antithesis of ownership. Some professional genealogists see this as a threat. If everyone can see and copy their conclusions, why will anyone pay them to spend the time and effort to write them in journals? So let's make reaching those conclusions as complex and difficult as possible. The answer is that the conclusions will be largely ignored by those involved online because they are guarded behind the legal curtain of copyright. I can't freely copy or incorporate your carefully crafted "proof statement" into my own family tree online because if I do so, you will threaten me with a lawsuit for "copyright violation" or try to intimidate me with accusations of plagiarism. The new paradigm includes an openness and disregard for proprietary claims that annoys and, in some cases, enrages those who "own" their research and conclusions. Someone recently asked me if I could start over again doing all my research today, what would I change. That is exactly the subject of this post and series. The fact is that some things have not yet changed, but the things that have changed have done so dramatically. I have already mentioned that the first 15 years or so of my genealogical investigations (not really research) could now be condensed into a few days or weeks. If this is true, then how is what we can do now the same and how is it different than what went on before and what is still going on? By asking those questions, now I can get to the next level of involvement with the information revolution. I can now begin to tap into the common core of information and benefit from the collective consciousness. What is our relationship with the large online database companies? How do we implement the information provided by mass digitization without losing the craftsmanship needed to be accurate and detailed enough to prevent the same research being done over and over again? What are the real limits of these online juggernauts? Well, this is why this post turned into a series. I need to summarize my thoughts at this point and then move on to some additional serious considerations. If I were starting over today, I would put what I know of my family tree on several online database programs. I would then spend my time adding in all of the appropriate and pertinent records they provide me by hints. I would expect that at some point the online databases would run out of hints because of a lack of digitized records. I would also expect that, by relying on several of these programs, I would have additional records added constantly. Within a short time, say a few months, I would probably start to see a pattern. Some of my lines would be abundantly documented. Others lines would reach the end of the online documentation. I would then begin the process of searching on those lines that still remained unresolved. Here is where the difficulty begins. Unless a person has a certain level of online researching skills, there is no adequate way for that person to know whether or not the information he or she is looking for is "online" or not. At this point, the researcher moves into records that are still in older formats such as microfilm, paper, etc. However, as records are found, they are digitized and added to the common, unified family tree, thereby preventing future duplication of the same research. All this time, I would keep checking the record hints to see if any of the issues I observe have been resolved. The "traditional" genealogist will never know whether or not the information is online or not, because they will have assumed that it is not or lack the online skills to determine that it is. Going back to the conference I alluded to at the beginning of this post, it was clear in several instances that the presenters were entirely unaware that the resources they were consulting were available online. In essence they were redoing paper research of online resources. We are pleased to announce the launch of new online services that will help Mexicans and the estimated 34 million Mexican Americans* research their family history. 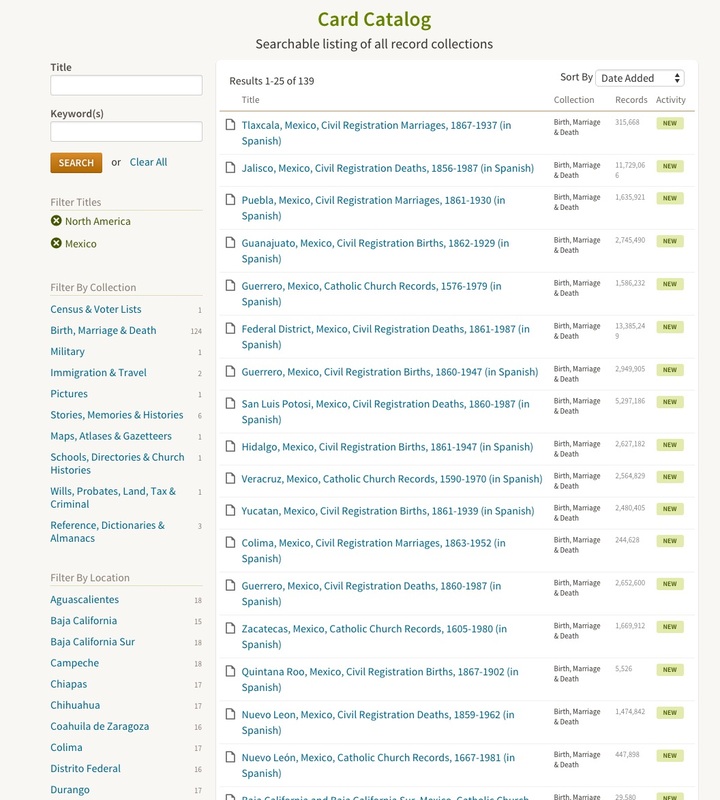 More than 220 million searchable historical records from Mexico, including new birth, marriage, and death records dating back to the 1500s are now available on the Ancestry site, many of them important historical records never before available online. The new collections show up in the World Subscription. Here are the details about a "free" view time period and the cost of adding the Mexican records to a U.S. Subscription. On the Ancestry Mexico site, the Mexico + US Package ($10-$12 USD per month) will include access to all Mexican records plus US records relevant to Mexican Americans including, census, immigration, border crossings, BMDs, and relevant regional records. All records from Mexico are also being made available as part of the World Subscription on theAncestry.com website. The Ancestry Mexico site is designed to meet the unique needs of people in Mexico, as well as Mexican-Americans with plans to enhance the service early next year. The search shown above was in Guanajuato, Mexico for the name Antonio Rodriguez. The markers that came up in the record are pop-ups that show where in the record the names of the family members are located. In another first, the new Ancestry Mexico site will provide a Spanish language experience tailored specifically to Mexicans and Mexican Americans. With such a culturally diverse population, nearly every citizen in the United States has ancestral connections to regions outside of America. Ancestry has been working hard over the past few years to help people of Hispanic and Latino origins discover, preserve and share their family history by making important collections from Mexico searchable online to get them started. These new records launching today were made available in part through Ancestry’s collaboration with the Mexican Academy of Genealogy and Heraldry based in Mexico City, Mexico, who originally created microfilm of these records with the assistance of FamilySearch International. These records will help Mexican Americans build and explore their family tree and unveil key events, places, and relationships in the lives of their ancestors, including the names of family and friends involved as witnesses or godparents. The people of Mexico have a diverse culture that comes from a variety of regions, including the indigenous peoples of Central and South America, and early immigration from Europe. With a deep sense of pride in this rich heritage, they are passionate about family and have been celebrating their ancestors for hundreds of years. Let's suppose that you were starting into researching your family history, oh say, thirty years ago. Let's further suppose that you lived far away from the Family History Library in Salt Lake City, Utah and the local genealogy library had very limited resources. Once you ran out of "home" sources, where could you go to find out more about your family? In my case, since this is where I found myself thirty or so years ago, I spent my "vacations" in the Family History Library. We stayed with my wife's family and I parked at the Library for four or five days of "research." My research consisted mainly of trying to figure out what had and what had not been done in discovering my ancestors. My collection efforts in the Family History Library were mainly focused on the existing family group records that had been submitted by my family members over the previous 100 years or so. I was trying to figure out what had and what had not been done by my extended family. I ended up with a two foot high stack of copied family group records which I began entering into a rudimentary program running on an Apple II computer. As I accumulated the previously submitted family group sheets, I spent a huge amount of time trying to verify the information. I made very little original progress except to make corrections. Everything I did was copied and there were very few source citations. Now we will start moving forward. Every year the computers became more powerful. At the time, I owned an Apple Computer Store and we got all the new models of both PCs and Apple computers. Subsequently, I kept migrating my genealogical data from program to program and computer to computer. The incentive was speed. As I added more and more people and my files grew in size, the computers were never fast enough to handle the additional data. Finally, there came a day when the speed and storage capacity of the computers exceeded any need I had. The programs and the computers could speedily handle tens of thousands of names and documents. Meanwhile, for many years, in fact, since 1938, FamilySearch's predecessor, the Genealogical Society of Utah, began a project to microfilm original genealogical source records from around the world. By the time they converted to digital acquisition, they had accumulated 2.4 million rolls of microfilmed records. Then we got the Internet. Just like the computers, at first it was slow and very cranky. Then it got faster and faster and pretty soon Ancestry and FamilySearch started digitizing their record collections and adding records online. The amount of information online began to grow geometrically. Now we come to real beginning of my story. 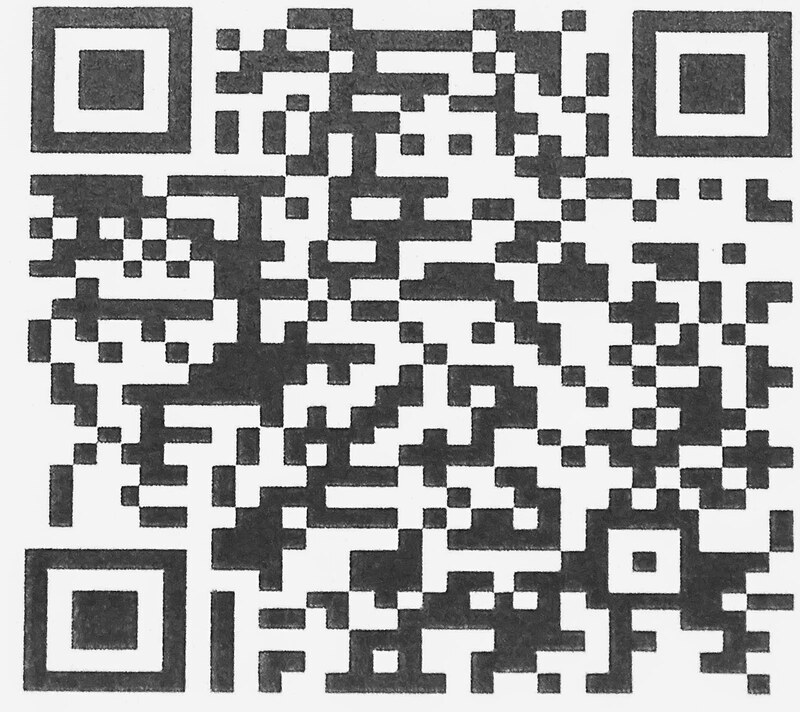 FamilySearch kept acquiring more and more records and eventually they began to digitize (convert to digital computer readable format) all the old microfilm records and began to acquire records directly with digital cameras. Soon there was a race to acquire larger and larger collections of online genealogically important records. Thousands of record repositories around the world began digitizing their records. Several companies emerged with huge online collections. While all this was going on, a few short years ago, a company in Tel Aviv, Israel made an extraordinary step forward in the way online genealogical database programs operate. MyHeritage.com was right up there with the rest of the large companies acquiring records. They began the step forward by improving on an idea started by Ancestry.com to provide hints as to applicable records for the individuals in an online family tree. This programming effort culminated in a series of programs designated Super Search, Smart Matches, Record Matches and finally the Record Detective. The development of these programs created the beginning of a major shift in way genealogical research proceeded. Because of the extraordinary searching accuracy of these automated programs, the entire methodology of genealogy began a dramatic shift. When a MyHeritage.com subscriber began entering information into a family tree, the program immediately began searching through a database, soon to accumulate more than 6.2 billion records, and find highly accurate matches. The user then reviewed the match and if appropriate, attached the record to the individual in the user's family tree as a source. If the record had information about a person who was not yet in the user's family tree, then the new individuals were added with the click of a mouse or other pointing device. With this highly accurate, automated search capability a proven fact and as an example, other large companies began developing their own systems of automatic record search or improving their existing capabilities. Now we come to the present. We have several very large, online, genealogical database companies that have implemented automated search capabilities relying on a user supplied family tree. The shift in the paradigm is that the previous, very tedious activity of searching individual records for ancestors is now automated. What I spent nearly 15 years doing in the Family History Library, can now be accomplished in a matter of hours. In contrast to my copying efforts, the new methodology can build a pedigree directly from original sources. Wait, wait, wait. Aren't I missing something important? Aren't I painting a picture of Shangri-La when the reality is far from realized? Don't we need to remember that there are still a huge number of records out there sitting in repositories in paper format? Don't we need to remember proper citation formats, proof statements and all that goes along with the time-honored methodology of real genealogists? Don't we have to do "real genealogy" and not rely on some ad hoc online family tree program? Well, the answer to all these questions is no. The automated genealogical search capabilities have now exceeded the ability of almost all experienced genealogists to find pertinent and appropriate records for their users. There are still limitations, but much of the basic and even some of more advanced genealogical tasks are now automated. A beginning researcher can now enter his or her basic information into any one of these newly updated programs and expect to have substantial amounts of information added automatically to their family tree. Before I get into a discussion of the limitations, let's look at the benefits. We need to realize that I can now use several programs at once. I have a developing family tree on each program. Obviously, I need to designate a home base, a place to keep my core information. I use one of the online family tree programs as my "main" program or I can use one of the many available desktop programs. The process is much simpler and less costly than my cumbersome activity of accumulating huge piles of paper family group records. I avoid the expense of regular trips to Salt Lake City, Utah and I get a complete survey of the work done by millions of genealogists around the world. This brings up a side note. I just finished driving from Mesa, Arizona to Provo, Utah. It took me about 11 hours and cost nearly $75 in gas and this is with a car that gets good milage. If I had to rent a hotel room and eat in restaurants to do research in Salt Lake, one trip could cost me many hundreds of dollars. When we start worrying about the cost of subscriptions to these new online databases, we need to remember what it used to cost to do the research directly in a library. Now, it is probably time to talk about the limitations we still face. First, these programs are search engines. They do not do the necessary analysis of the records they find. We still have to do our part to make sure the process is finding our relatives and not just matching names. There are also temporal and geographical limitations. Some areas of the world do not yet have any digitized records. If our family comes from these parts of the world, then we are back to microfilm, hiring researchers or traveling ourselves. I will get further into the "objections" raised by the "real genealogists" in a future post. But now I need to summarize where I am with explaining this process. I used to spend untold hundreds of hours searching through paper records in the Family History Library just to discover what had already been researched about my family. In essence, I was duplicating work done by others. With the new online, automated search programs, I could accomplish the same work in a relatively short period of time. As a bonus, I am constantly finding people and adding sources that I would never have found previously, simply because I would not have spent the additional time needed. Tune in next time when I address the "sour grapes" genealogists who are struggling to keep us on the one true path to doing genealogy. I have been teaching quite a few classes lately on this subject and so I thought it would be a good idea to put it in writing. Actually, I have also been writing about this same subject for some time, but it is probably a good idea to put it all in writing instead of piecemeal around in various posts. This post may turn out to be a series depending on whether or not I can explain what takes more than an hour of class to explain. To begin, I need to review a brief history of genealogical methodology. For several hundred years, there have also been "professional" genealogists. These people, mainly interested in history and their own survival, very early worked for royalty compiling kinship and descent books to support claims to legitimacy of those in power. These early family historians were also involved in heraldry, the practice of creating images (standards) to identify royalty. Some of these compiled lineages date back thousands of years. The original motivation for individuals to get involved with genealogy was to "prove" a familial relationship with royalty. In the United States, researching family history got a boost in the 1800s with claims to heirship in Great Britain and elsewhere. The idea was to prove a relationship and share in an unclaimed estate. The idea that someone might have an unknown relationship to a person who died leaving a large estate without heirs resulted in many entrepreneurs establishing heir location businesses. This activity still exists today. As an attorney, I used to get regular advertisements from currently operating heir location services. In about the mid-1800s there were the beginnings of interest in investigating individual genealogies simply for the purpose of establishing family relationships. This interest resulted in loose family organizations and the establishment of genealogical societies. The first such society in America, was the New England Historic Genealogical Society founded in 1845. This society is still in existence and has the AmericanAncestors.org website. 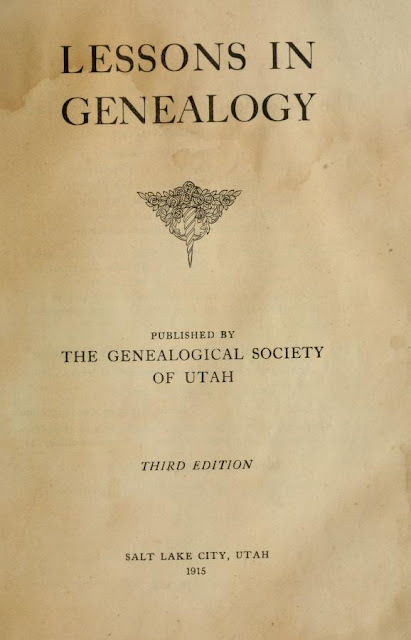 Another early society, the Genealogy Society of Utah was founded in 1894. It successor organization is known as FamilySearch and maintains the FamilySearch.org website. Today, genealogy is usually subject to vastly over-exaggerated claims as to its popularity. Even today, the number of professional genealogists is vanishingly small compared to almost any other interest or profession. Although there is wide participation in family history on a casual basis, the serious adherents constitute only a very small number of people. Going back to the pre-computer days, a genealogist's work consisted of following the classic "Research Cycle" of beginning to accumulate family records. These records most commonly consisted of Bible records, letters, photos, assorted documents such as marriage records, death records and perhaps some military records. This genealogist usually became known as the "family historian" and could recite what had been preserved of the family's oral history. These records were maintained in boxes or scrapbooks or albums and trotted out for display at family gatherings or when another individual family member showed any interest. In some cultures this person would have the status of the official record keeper. Many of today's older genealogists got their start from association with this family record keeper. Early in the 1900s, genealogy began to be systemized. One of the earliest such efforts, that I have been able to locate, is the Genealogical Society of Utah's Lessons in Genealogy published in 1915. We shall assume that the reader is entirely unacquainted with the methods employed by trained specialists in this art ; and that he desires full and careful directions as to how to begin and how to continue his labor. His first requisite is notebooks, record books, pencils, paper, and ink. The notebooks should be preferably about seven by ten inches, as this permits space for dates and names across the page. The Genealogical Society has had prepared properly ruled and printed notebooks for this purpose. They may be obtained from the Society at 10 cents each. The book for a family record of temple work may be purchased at the Genealogical Society office, which keeps the approved form, bound in one, two, and three quire sizes. The prices are: One quire, $1.25; two quires, $1.75; and three quires, $2.25. A soft and good pencil is advisable, as there are often erasures to make, especially with beginners. The pencil should have a rubber. You might note the word "quire." A quire consists of four sheets of paper or parchment folded to form eight leaves, as in medieval manuscripts. It may also be 24 sheets of paper or 1/20th of a ream. To go into a genealogical library, or into churches, cemeteries, recorders offices, or state depositories, to search deeds, wills, and other papers of identification and thus to weave a perfect chain of ancestry work for several hundred years constitutes a business of no small proportions ; and the ability to take that genealogical data and to record it first in proper note books, then to transcribe it into record books for temple work is another business in and of itself. But surely the Latter-day Saints should acquire this knowledge and become proficient in this business. For it is their business, above all the peoples of this earth. For this reason, we have undertaken to furnish these lessons, which we hope will enable a student to acquire sufficient skill to do this work. Despite the obvious religious overtone, this is a pretty good summary of what genealogists did until quite recently. With the introduction of computers, most genealogists kept following exactly the same procedures they had learned from these early efforts in the late 1800s and early 1900s. The only difference was that some of the record keeping portion of the work moved from paper to the computer disks. If I were to talk to any one of the hundreds (thousands) of genealogists I have met over the past thirty years or so, I would find that almost all of them are still mired in the original methodology. If they use computers, the computer is no more than a mechanical substitute for paper and pencil. Some indications of this stagnation include the recurring questions about how to print out all the information accumulated online and questions about how to print a book about an ancestor or family line. Typewriters began the transition from the ancient methodology to a newer one. But I still see handwritten family group records and pedigree charts. Many people still say they have to write out things by hand to visualize the relationships. We are in a transitionary period and older genealogists are still resisting the changes that have come very rapidly in the last twenty or so years. This brings us to the combination of computers with the Internet. Here I am writing away during my visit to Mesa, Arizona and those few who read these posts will see this writing almost instantly around the entire world. The impact of this technology is just now reaching global proportions. By their nature, genealogists are generally older and less susceptible to changes; technological or otherwise. Of course, records have been accumulated, for a variety of reasons, in libraries and archives for thousands of years. Access to these records was limited to those people who were allowed to study them and even more importantly, those who were able to travel to see the records. A cottage industry grew up in the genealogical community of record searchers, people who would go to a large library or other repository and look for records. This still exists today. In fact, we have a newer version of the cottage industry appearing online with cooperative search websites such as AncestorCloud.com. Many traditional genealogists take comfort in focusing on the number of records in the world that are still locked up in paper copies. They justify their reticence to shift to the new methodology by claiming that "not all the needed records have been digitized." Yep, they are right. But what is more important is the fact that billions of the genealogically significant records have been digitized and the traditionalist has no way of knowing what has and what has not been made available online. As I continue this discussion, I am not going to focus on the "professional" aspects of genealogy. As I mentioned earlier in this post, they make up an insignificant minority of the number of those people who are involved casually in accumulating family history. My focus is on the person who is just now beginning to have an interest in family history. The rapid changes in technology have a much greater influence on the beginner than they do on the traditionalist. In fact, the traditionalists, professional or otherwise, are being pushed into the backwater of genealogy. This brings me to the radical changes in methodology that have evolved over the past ten or so years and have only become workable in the past five years. The change dates from the significant introduction of the MyHeritage.com Record Match technology and its secondary technology that goes by the name of Record Detective. Of course, this technology would not have developed without the huge changes that come with the entire technological computer revolution. This is often referred to as the dawn of the Information Age and genealogists are being dragged into the Information Age whether they like it or not. Well, it looks like to me that I will have to make this into a series. You will have to excuse my brief absence while I travel back to Provo, Utah, and I do have more to write about on this and other subjects. Showing Alternative Relationships – Does your program show these relationships? There are a huge variety of familial relationships in the world. This is not new development. I have written about this issue a few times, especially about kinship systems and other types of relationships. For example, in many countries, there is a strong tradition of godparents. These people assume some of the responsibilities for the care and support of a child in some circumstances. So how do you show this relationship on a standard pedigree oriented family history program? I returned to this topic, in part, as a result of a question asked by a person at the Mesa FamilySearch Library Conference I presented at this past week. The question was directed at the FamilySearch.org Family Tree program and the ability to enter data concerning an "alternative" marriage arrangement. Since the people in question were alive, I suggested using a desktop based program to record the information. But the question once again raises the issue of representing a huge number of other types of relationships in a way that documents how these relationships affect the family unit. It is analogous to having an electronic device that will receive only kind of electronic signal when there is a whole spectrum of signals out there. Genealogy has traditionally focused on bloodlines. The "traditional" pedigree chart and family group records allow for one marriage per individual. The traditional way of handling multiple marriages was to create additional paper family group records for each family relationship. If both the husband and the wife had multiple marriages, you could end up with several family group records, all for the same two people. If one of my grandparents had a second spouse, for example, in the United States in our English-speaking culture, we would call the second spouse a "step-mother" or "step-grandmother" or some such designation. Culturally, we do not consider the stepparent's relationship to be equal to the biological parent's relationship, even if the stepparent provided all of the care for the children of the first wife. In polygamous families the relationships were even more complicated. The siblings may have been raised by different mothers, but the children considered themselves to be brothers and sisters. Sometimes, there was an acknowledgement that they were only "half siblings." But that designation usually came from the descendants, many of whom wished to ignore the relationships altogether due to the social stigma attached. The graphic representations of these types of relationships tend to be minimized and somewhat obscured. For example, in the FamilySearch.org Family Tree program, you can select the "preferred" relationship and not view the alternative marriages etc. In many cultures, you are not really related to your siblings spouses. In the United States, they are commonly designated as in-laws to emphasize that there is no "blood" relationship. However, the children of such relationships are "cousins" and are considered part of the family. What relationship do you have to your children's spouses' parents? You may or may not have any relationship with them and may not even know their names even though they are your grandchildren's grandparents. Some cultures extend these relationships much further than is commonly understood in European dominated culture in the United States. English does not even have words that indicate these relationships and, of course, the genealogy programs can show these people, but genealogists do not usually pursue research into "collateral" lines although there are exceptions. The relationships shown in our genealogy programs highlight the collective view of one dominant cultural perspective. Perhaps is time to examine this bias and expand the viewpoint. From a research standpoint, our somewhat narrow view of the family structure limits our ability to focus on possible records. In fact, because we culturally reject some relationships, we are in essence ignoring a lot of our history. My wife and I have spent entire days sitting in university special collections copying documents using cameras where this is allowed. Usually, she turns the pages and I take the images. Most of the special collections libraries have a substantial charge for making copies and prohibit scanners, but we have found them open to allowing cameras. My interaction with the special collections libraries at different universities has brought home the importance of these collections to those doing genealogical research. Many researchers look for the names of their ancestors as if the names alone were some kind of magic talisman that was going to reveal all of their family history. Sadly, this is not the case. Genealogy is basically historical research and many times your effort to find your ancestors must be based on a general search of all of the possible historical documents in a particular area at a particular time. University special collections departments are like black holes, sucking in all sorts of rare and interesting documents. Although geographic proximity is important, that is, the library should be in the same state where your ancestors lived, it is not always the case. One major collection about my Great-grandfather Henry Martin Tanner is in Salt Lake City, Utah at the University of Utah even though he lived his entire life in Arizona. In this case, the person who did all the research and donated the documents to the University of Utah lived in Utah at the time he died. 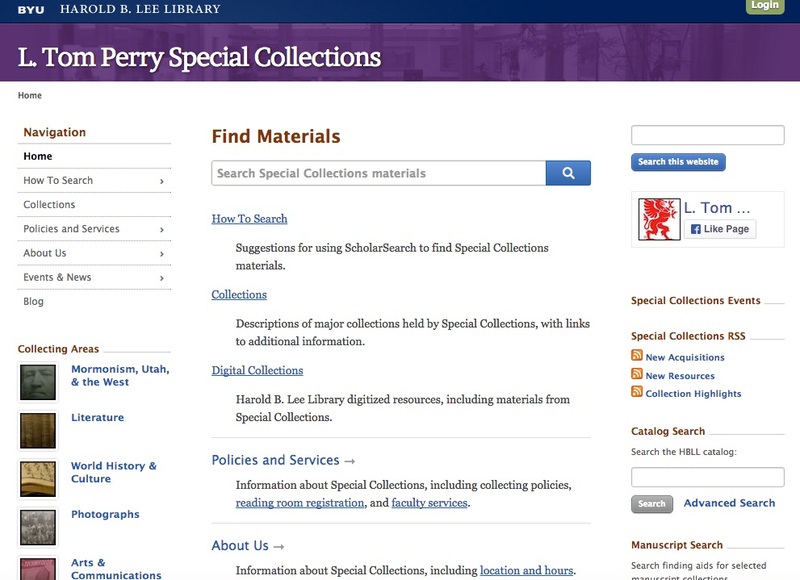 Since the special collections libraries are not very selective, you may need to research the catalogs of many libraries before finding the jackpot in one. This was reinforced to me when I began investigating the universities and colleges in North Carolina. There happen to be 16 major universities and a huge number of colleges. Every one of these has a library and the potential to be the host of records about your family if they lived in North Carolina. Fortunately, most or nearly all of these libraries around the country have extensive catalogs of their holdings. In some cases, you may find extensive entries listing the documents in a particular collection. It is also a good idea to search in the WorldCat.org catalog for the names of your ancestors and the places where they lived. You never know what you will find until you start searching. Here is a screenshot of one of the collections of documents I have donated to libraries. This one is from my Great-grandmother, Mary Ann Linton Morgan and contains the names of thousands of her relatives. If you look carefully at the entry, you will see that the collection contains two linear feet of documents. That is thousands of pages of information about her family collected over her lifetime. Can you really assume that your relatives are not mentioned in such a collection that might exist in a library somewhere in the country where they lived? Here is the same collection as found in the WorldCat.org catalog. The Mary Ann Linton Morgan family papers contains genealogical information and pedigree charts compiled by Mary Ann Linton Morgan. Also included are letters from 1869, 1878. Old family trees of the Sutton family are included. A diary from 1924 is contained as well as the patriarchal blessing of Mary Ann Linton Morgan. In addition, there are two letters to the family of John Hamilton Morgan from Heber J. Grant. Missionary photographs from the 1930s in Tonga are included from an Elder Vincent. The collection contains documents from 1869-1990 but primarily consists of materials from circa 1930-1950. You might notice that some of the documents are not from her family at all. How would you ever know unless you search? Are You Being Thorough and Accurate? What is online and what is not?